Last week I saw three empowering movies for girls that were very different from each other, but had valuable messages. I’m a member of Generation X, raised by Baby Boomer parents. My mother was part of the first generation of women who were encouraged to work full-time and have a family. I’m not naturally inclined to domesticity, so I grew up dreaming about goals and achievements instead of decorating and cooking. However, I still struggle with my identity. Am I a stay at home mom? Or a career woman? Is there something in between that won’t tear me into pieces? Not so far. But, every day, I strive to find that balance. Meanwhile, I have a son and daughter who are watching every move I make. I don’t want my son growing up to think that his wife (if he chooses one) will bear the burden of all the housework and child-raising. I also don’t want my daughter to think all that is entirely her responsibility (if she gets married or has children). I want her to have confidence, opportunity, drive, ambition and a dozen other things that will see her become the amazing woman I know she’ll be. She’s crazy smart, so I dream about her being a scientist, an engineer, a physician or some other brainy career. I also want her to love herself. The struggle for a girl to maintain a healthy body image and self-esteem in today’s world of multimedia is well-documented, in written studies and films. I try desperately hard to walk the line between encouraging her to take care of her appearance, while not prioritizing it above, say, competing in Math 24. I know I’ve failed many times and said the wrong thing. The older she gets, the better I get at not saying anything about her appearance. Kicking old habits, and life-long misconceptions, is very difficult. Lucky for me, the world is slowly — so slowly — waking up to the same reality. My generation is the tiniest bit more removed from the false idea of the 1950s housewife than my mom’s. I’m hoping my daughter’s generation will be even further removed, but it’s so hard to fight the influence of the media that surrounds us. For instance, in my house, we don’t have fashion magazines. I don’t weigh myself all the time or talk about all the improvements I want to make to my face and body. I don’t comment on other women’s looks or even compare myself to other women. Yet, when my daughter was 6 years-old, she made a comment that took my breath away. We were looking at an Athleta catalog (don’t ask me why, I stupidly assumed I’d find something that was structurally sound enough to wear) when she asked me if she was skinny. I said no, thinking she was beautifully rounded and strong. She looked devastated. I quickly said what I was thinking and assured her that she was perfect just the way she was. When I asked why she wanted to be skinny, she said, “Because skinny is better.” It was my turn to be devastated. I had tried so hard to protect her from that kind of thinking, but it snuck in anyway. That’s where Embrace comes in. Embrace is a documentary that was born from Taryn Brumfitt’s Instagram post that went viral. She posted a “before” picture of herself in a body-building contest and an “after” picture of herself, naked, in all her post-three-babies glory. She flipped the stereotypical concept of “before and after” and women everywhere responded. She realized she had touched on something important and decided to do something about it. She teamed up with a documentary team, traveling the world to talk to magazine editors, fashion models, burn victims and all kinds of other women, about their feelings about their bodies, and the pressure to be stick-thin, no matter the cost. Embrace is reaffirming, eye-opening, funny, sad and wonderful. I encourage every woman, especially if you have a daughter, not only to see this film, but take every girl and woman you know with you. A friend and I took our daughters, and I was so happy I did. My daughter is uncomfortable talking to me about gnarly things, but we discussed a couple of the most astounding scenes in the movie. My hope is that the message sunk into her head (because — you may not know this — children frequently tune out their mothers, can you imagine?). Some might be shocked that I took my 10 year-old, because there are lots of images of naked women, even their most private parts. But I rejoiced! Of course she should see what real women look like! Seriously, it’s a tool that every mother of a daughter should use, nudie shots and all. Only two days after seeing Embrace, I took our Girl Scout troop to see Hidden Figures, which was paid for by our local Junior League. The movie didn’t start until 7 p.m., so I figured not many of my girls would come. Happily, almost all of them came! I’m so glad to have shared that experience with them. I guarantee that most of them, if not all, had no idea what African-Americans endured only 50 years ago, let alone African-American women. I loved that they learned about three women who used their brains to get ahead. I loved even more that they watched how those women had to fight to use their brains to get ahead. The racism and sexism they encountered didn’t exist in big gestures or thematic ideas, which is how I think the girls see those -isms, because they’re so removed from all of that. (We also live in an affluent, fairly insulated area.) They witnessed racism in small ways, like not being allowed to use the same restroom or drink the same coffee. They saw the surprise on men’s faces when these women solved impossible equations and learned programming that the men didn’t understand. 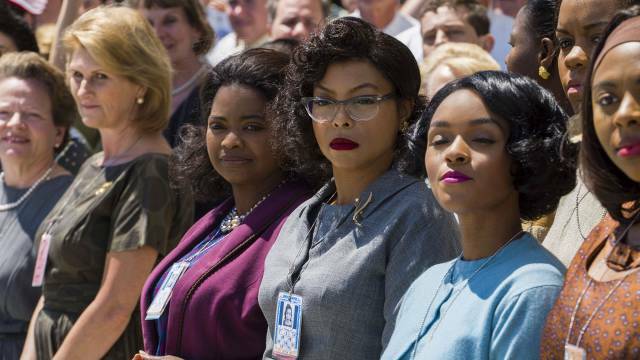 Hidden Figures was also eye-opening and reaffirming, for the girls as well as myself. The last movie my daughter and I saw — during possibly the biggest movie week of her life — was Moana. She had been wanting to see it and actually said so! (She rarely tells me what she really wants, unless it’s in direct contrast to something I’m telling her to do.) I love Disney movies, as a rule, so I was game to go. I did not expect to love Moana as much as I did. I was so moved, and so impressed with the message. There wasn’t a prince in sight (thank God!) and not a single character commented on Moana’s looks. In fact, Maui makes a joke about her being a princess, and Moana declares, very firmly, that she is not a princess. And the characters were complicated. Maui, Moana’s counterpart, was kind of a jerk. She schools him, big time. There were no easy answers and I truly didn’t know how the story would go. So, there are three empowering movies for girls I discovered almost by accident. In searching out movies that would have powerful messages for myself, I found movies that had powerful messages for my daughter, as well. Such a great post! LOVED Embrace and I was pleasantly surprised that my 11 year old daughter didn’t even flinch at the scene of V’s/lady parts…what are we supposed to call them now anyway? At the same time I was relieved that I didn’t ask my mother (baby boomer) to join us because she undoubtedly would’ve gasped and thrown a jacket over my daughters head. LOVED Moana, the story, the character, the thick calves!! I know we’re not supposed to comment on looks but YAYYY DISNEY!!! I’ll be back after we see Hidden Figures. What else can you recommend? You have the best taste in movies!